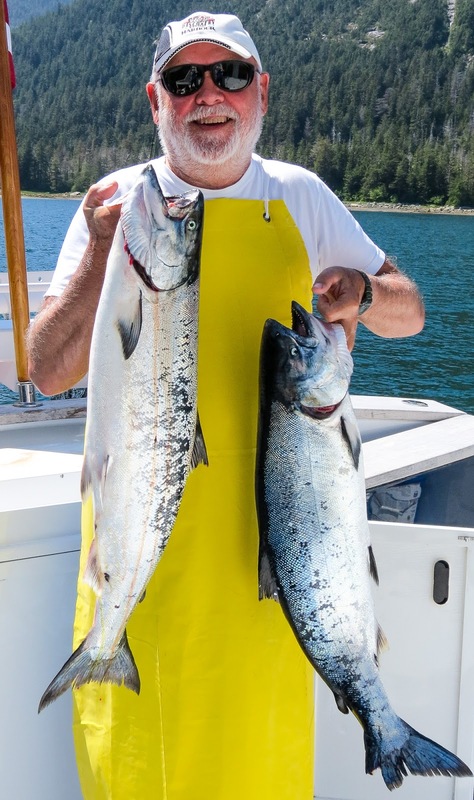 Sometimes - when fishing has been good, when the weather cooperates, when the Capt. feels like manning the barbecue – we feast on Ron’s special Smoked Salmon with a Honey Lime Pepper Glaze. This delectable treat isn’t a quick, spur-of-the-moment preparation. While not difficult, it does require planning ahead to accommodate overnight brining and an hour or two of carefully tending the barbecue. It’s well worth the time spent monitoring, and taste-testing, the low-and-slow batch of smoked salmon. 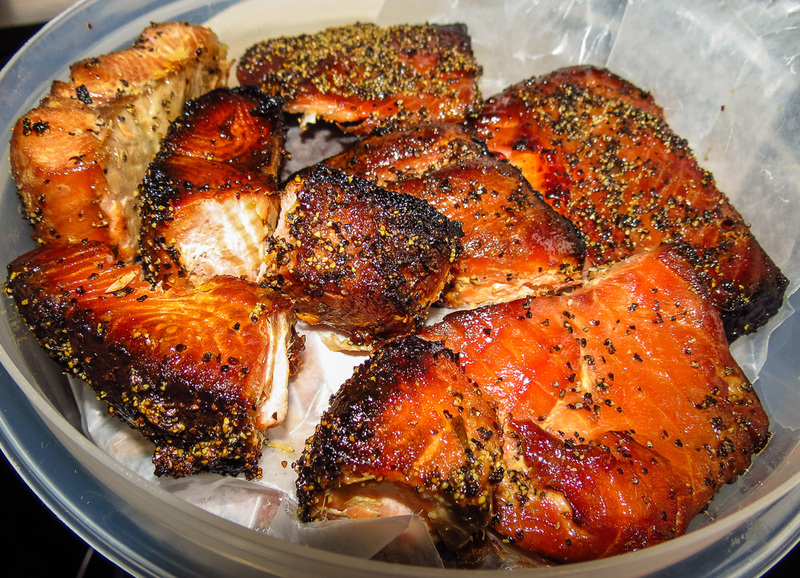 When smoking big batches of salmon ashore, I use multiple Little Chief smokers. These electric units make it easier to regulate the temperature with minimal tending, but smoking aboard seems to add something special to the flavor. Either way, freshly smoked salmon has been a major hit with both crew and guests. Add the brine ingredients to a large glass or other nonreactive container. Whisk together and microwave until the sugar dissolves. Chill thoroughly. Place the salmon strips in the brine, one at a time so each piece is coated on all sides. When all of the salmon strips are in the container they should be completely immersed. If necessary, weight down the top surface with a plate to keep everything submerged and covered in brine. Cover and hold in the refrigerator overnight or at least 8 hours. When ready to smoke the salmon, remove the strips from the brine. Lightly rinse to remove the bits and pieces of pickling spice, dry with a paper towel and air dry on a baking rack for 3 hours. Air-drying sets up a dry finish and will encourage absorption of a smokey flavor. Preheat the barbecue grill to its lowest setting (85-120 degrees F), arrange the wet wood pieces across the grate, leaving small gaps between each piece for smoke and air flow. Place the brined-and-airdried salmon chunks on top of the wet wood, leaving a gap between each piece. Close the lid and let cook at the lowest temperature possible for 20-30 minutes. After the salmon has cooked for 20-30 minutes, baste with the Honey Lime Pepper Glaze. Cover and continue smoking. Continue to baste and check for doneness frequently; for the thinner pieces check every 15-20 minutes and remove from the grill as they finish. RL likes to add one last coat of the honey/lime glaze as he takes each piece off the grill. Sampling is the recommended best test for doneness. <grin> It may take several hours, up to 2 to 3 for thicker pieces of king salmon. Serve immediately or cool and store covered in the refrigerator. Use as an appetizer, snack, or an amazingly tasty addition to soups, salads, or breakfast dishes. *Quick Cook Note: if I’m in a hurry or the weather is really crummy, I’ve brushed the fish with a few drops of liquid smoke diluted in some water, and slow-baked the racks over baking sheets in a 180 F or lower oven. It works, sort of. One step better is to partially cook on the barbecue grill and finish in the oven, but nothing is as flavorful as a total smoke on the barbecue (or in an electric smoker with wood chips). *Canning Note: after the salmon cools I pack it into pint or half-pint jars and have to refer to a canning book or on-line link for the time and temp details. Smoked salmon takes as long as fresh salmon; some of the oil will come out of the fish, so I turn and up-end the jars every so often if I store it a long time. Fresh salmon usually calls for barbecuing a fillet… usually. However, there is no way our gas grill will stay lit when the wind gusts reach 30 knots, and The Capt. isn’t too enthusiastic about manning the grill in a windy downpour either. Fishing in unsettled weather is an entirely different thing, however. This week’s changeable weather meant switching from our favorite outdoor grilled salmon to two galley recipes instead. One night Cast Iron Skillet Salmon utilized the thinner tail end of a king (Chinook) salmon fillet. We consumed every last shred at dinner – sigh! no tasty leftovers for salmon salad or salmon spread with this recipe. The thicker head-end of the same salmon fillet seemed perfect the next day for an oven roasting experiment. I have baked salmon before; sometimes with a lemony, garlic butter, scampi-style sauce… or a peppy and creamy green chili sauce… or wrapped in parchment en papillote… etc. 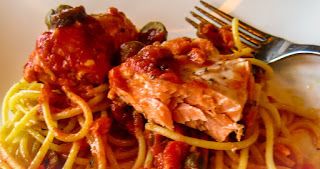 It must have been the crazy, changeable weather that encouraged me to go a little wild and pair the remaining portion of that gorgeous salmon fillet with a savory, spicy Italian puttanesca sauce. Red sauce with salmon?! I know, I know, it sounds a little over the edge but OMG, this combination worked! 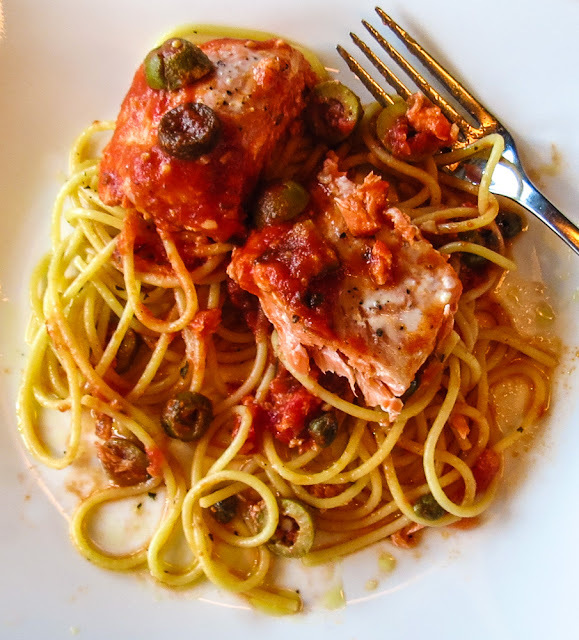 The salmon held its own against the robust sauce, delivering flavor beyond expectations. 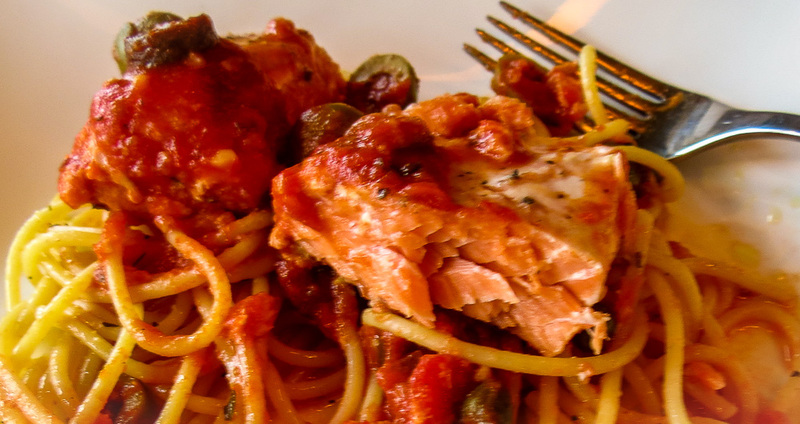 Salmon plus sauce makes a delicious entrée, but add some spaghetti to the plate and it’s heavenly and filling. Note: I tossed the cooked pasta with a drizzle of olive oil and a sprinkle of garlic powder, keeping it warm in a covered pan while the salmon finished. To serve I added a swirl of spaghetti to each warmed plate, topped the pasta with salmon and spooned a bit of sauce over each portion. Next time I’ll save some pasta cooking water to thin the sauce a bit before this last step – or just make more sauce. Add all of the sauce ingredients to a saucepan; bring to a boil then lower the heat and simmer for 5 to 10 minutes to blend the flavors. Stir occasionally. Sprinkle the salmon with pepper; place in baking dish just large enough to hold the fillets with some space in between each piece. Ladle the sauce around the salmon and place on the middle rack in the preheated oven. Bake until just cooked through, 10-15 minutes for thinner pieces and 12-20 minute for thicker chunks. Remember, fish will continue cooking for several minutes after you remove it from the oven. Serve immediately on warmed plates, or even better top a swirl of hot, cooked pasta with a fillet and a dollop of sauce. *Next time I’ll try adding ¼ cup chopped scallions (white and green parts) and a handful or two of baby spinach leaves or kale to the sauce… just because. *Halibut is another good choice for this preparation. “Sometimes you feel like a nut, sometimes you don’t…” That catchy jingle ran through my brain, though I can’t remember which food product it advertised. No matter, we definitely felt like nuts -nutty halibut that is. Boat guest Laci caught the first flatfish of her visit, a nice 25-pound halibut that produced one good-sized fillet that was more than enough for dinner for dinner and three more fillets to freeze for her to take home. I still grin thinking of her heavy duffle bag stuffed with clothing and rain gear plus frozen halibut fillets and three frozen whole coho (silver) salmon. 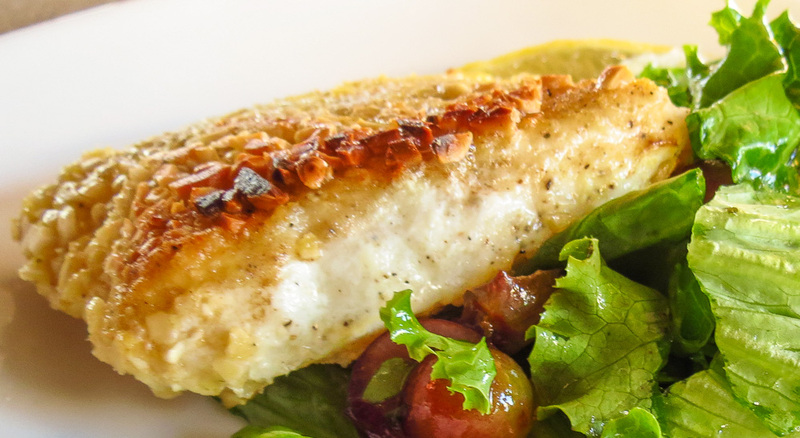 Halibut is such a versatile fish, yielding roughly 80% of its weight in firm, delicious edible white meat. Yummmm, think succulent citrus ceviche, or tangy sweet and sour kabobs, maybe moist and flaky deep-fried fish and chips… and on and on. The list of possible preparations is lengthy, but last week a nut-crusted recipe was perfect for a quick galley meal featuring the day’s catch. Combine the breadcrumbs, pecans and lemon pepper in a small bowl and stir to blend. Place the fish fillets, skinned side down, in a lightly oiled rectangular baking dish; season with pepper. Spread a teaspoon of mustard on each fillet. Pat the nutty breadcrumb mixture evenly over the top of the fillets. Bake 10-15 minutes, depending on thickness, until fish is slightly opaque and topping is lightly browned. Check early – beware of overcooking the fish! Transfer to a warmed plate or platter and serve immediately. - The recipe is meant for salmon as well as halibut. - Substitute other nuts if you like: almonds are a favorite. - Serve atop or alongside greens mixed with halved red grapes, toasted pecans and a light honey vinaigrette. Add lemon wedges and a fresh loaf of French bread for a light lunch or supper plate.